In addition to generating manufacturing reports such as cut lists and material takeoffs, this cabinet program is a great sales tool. Good cabinet making software gives you the ability to quickly create and present 3D renderings of initial designs to your customers, then quickly revise those designs as necessary. Cabinet Solutions offers different ways to view your jobs, including mechanical elevations, wall elevations with doors displayed, floor plan and cabinet customization. As you design a project, the cut lists & door lists are generated in real-time and available for you to review at any stage. Take a look at the screenshot and download the PDF down below for a detailed look. Cut Lists, Door Lists, and all other reports are based on your parameters (e.g. your joinery methods, overlays/reveals, material thicknesses). Print everything or just face frame parts (unless doing frameless), or just box parts, or just door parts. The built-in panel optimizer is a unique feature that will optimize your boards for faster cutting. The program optimizes for rip cuts first, cross cuts second by default to give you the fastest cutting solution. You can also specify rotatable to be able to have your non grain directional panels pack more on each board, so you spend less money on materials, and are able to pass that savings on to your customers. You can even add your random sized panels (panels that are too small to be a standard size sheet of material, but too large to be considered scrap) into the optimizer to help you reduce waste around your shop. Rip cuts first, cross cuts second to give you the fastest cut. You can select the entire job, individual cabinets, or individual boards to optimize. Add your random sized panels into the optimizer to reduce waste. Get the yield and waste percentages of each panel to help you price your jobs better. Job costing can be calculated by lineal foot or by materials + labor + profit, depending on the needs of your shop. If you choose material + labor + profit, you enter in the program how much you pay per square foot for each type of material, and how much you pay for your hardware, then you add a profit percentage on top of that. With a click of a button, you can print out a bid or proposal sheet for your customer’s approval! One of the most unique things about this cabinet software is the ability to customize your standards to how YOU build cabinets. You can change the construction methods, adjust the materials to what you use, switch between European (or frameless) and Face Framed style cabinets with the click of a mouse. We also include several different types of door styles, and panel styles so you can create over 100+ types of doors for your customers. You aren’t limited to only one set of standards for Euro and Face Frame, you can have as many different types of standards as your computer can hold. You can also choose to work in inch or metric units. Cabinet Solutions CNC is design software for the custom cabinet maker. 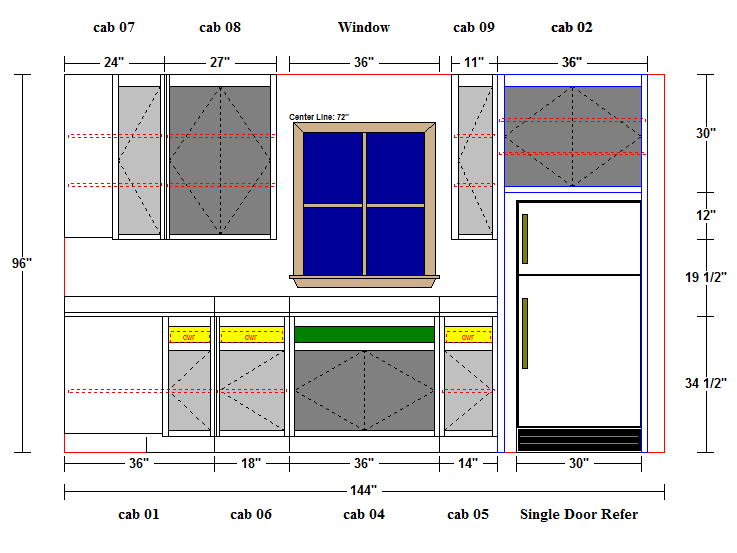 Need a bit more from your cabinet design software than an easy to use layout and design package? Keeping with the tradition of how easy Cabinet Solutions is to use, now cabinets drawn in Cabinet Solutions can be exported to our CNC Exporter where you can set up dadoes, and hole patterns with just a few clicks of the mouse. From there you can export code to your machine for a complete nested CNC cabinet software package!